Through his music, Bernstein demonstrates this point very clearly and I think it’s something that we often overlook in our practice and playing as jazz musicians. The word contrafact is a common one in modern jazz. Many tunes are based upon the changes of an older, wiser tune. Take “Koko” By Charlie Parker and “Subconscious-Lee” by Konitz, these are based on the changes of two classic standards, “Cherokee” and “What is This Thing Called Love” respectively. Yet the melodic content of both these tunes is totally different to the original standard they are based on. This should affect your improvisation in exactly the same way - the melodic content of your solo should differ according to the melody. Bernstein mentions this concept in a YouTube video about his attitude to tackling Monk’s music (). I think he definitely ‘walks the walk’ when you listen to how closely involved with the melody he remains in his solos on this album. He is definitely not just playing altered licks on a Monk chord progression. This album has been one of my staple listens since I discovered it a couple of years ago. 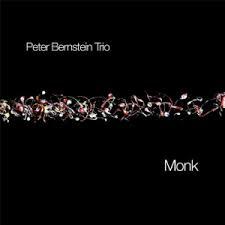 Bernstein evokes such an understated class in most things he plays and this, coupled with a complete and thorough facility on the guitar, gives you a winning formula. Namely, an overall sense of interaction and freedom which is exactly the vibe a Monk tune must exude. Have a listen to the way he plays the head of “Let’s Cool One”, “Panonnica” and “In Walked Bud”. Notice how he uses double stops and simple three note chords to outline the harmony – he particularly uses the interval of a tone in his playing to create a sudden dissonance – something that Monk regularly and instinctively did in his piano playing. Playing a melody in this style on the guitar is really affective and something definitely worth looking into. It’s very hard to find the perfect balance between a chord-melody style, similar to Joe Pass’ playing, and a single note melody but this middle-ground is very enticing to listen to and fun to play. 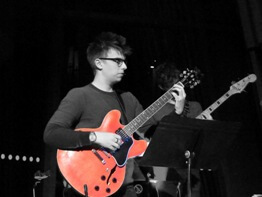 The first track, “Let’s Cool One”, has become something of a cult favourite in the jazz guitar world. It is a master class in economy and phrasing, not to mention a perfect transcription project for those of us who would like to learn more about the altered scale and it’s many uses. Having transcribed this tune, I have included a short 4 bar section with a couple of really awesome licks in it! 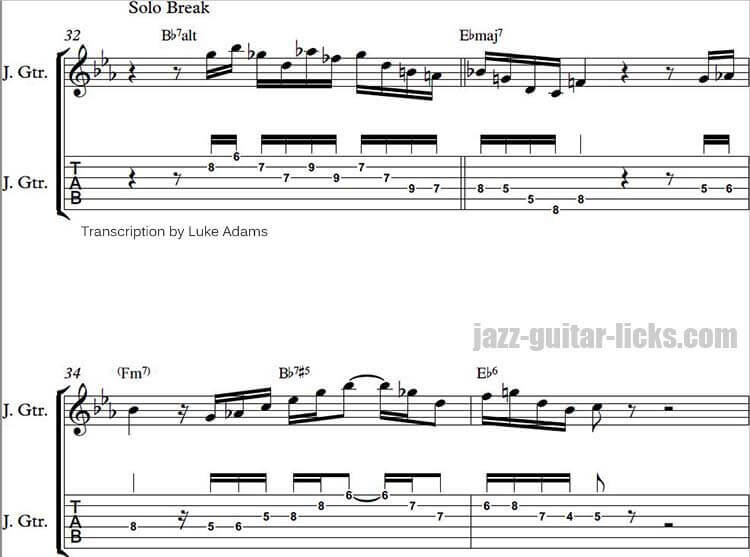 His solo break begins with an amazing and technically challenging altered lick using 3rds and enclosures and finally landing on the 9th of the Ebmaj7 chord in the next bar. If you are lacking in altered dominant licks resolving to the 9th then this is the lick for you. The second lick uses an Ab maj7 arpeggio on to outline all the natural extensions of the dominant (Bb). This is a very useful and applicable thing to use in your own playing and is a handy trick for playing on any dominant in any key. He finishes off the lick by including the #5 and then plays a diatonic enclosure on the 6th of the tonic chord (Eb). If you are lacking in licks using arpeggios and resolving to the 6th then this is the lick for you. We’ve learnt how important it is to consider the melody when you are improvising on any tune – but Monk tunes in particular. We’ve looked at how Bernstein uses harmonic and intervallic textures when he’s playing a head. 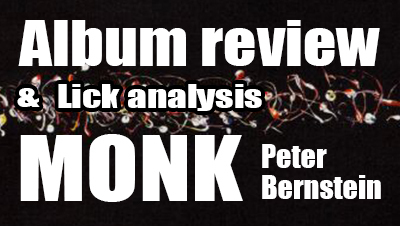 We’ve analysed two of his licks in depth. We’ve taken what we saw when analysing his licks and learn new concepts for practicing improvising. I hope this review and post has been useful and I’ll be back with another article for you next month! Top 10 list of best jazz drummers of all time. How to learn guitar scales in 5 easy steps. Learning and memorizing number of guitar scales is an important step in developing your skills as a jazz guitarist. This guest post provides 5 ideas for learning scales on the guitar. How to choose a jazz guitar from among different body styles as archtop, semi-hollow body, semi-acoustic and solid body. This blog post is a Marc-André Seguin post that provides some tips and tricks for beginners who would like to learn jazz guitar.